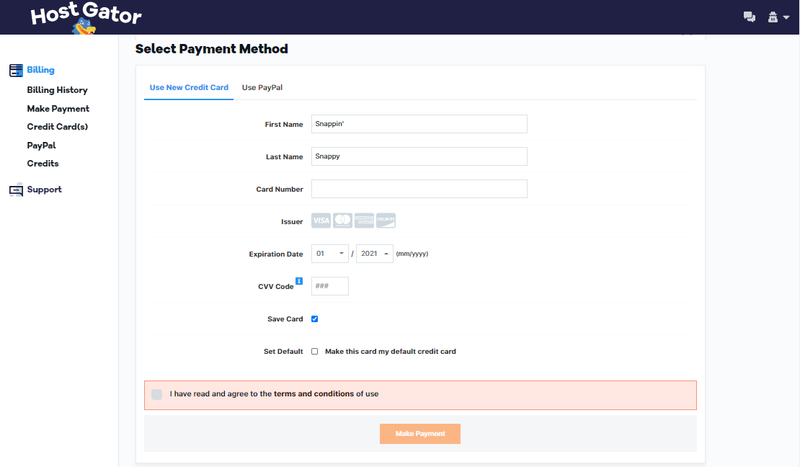 The Make a Payment page enables you to make a one time payment for due invoices or to pre-pay invoices for any active package. How do I Make a Payment via Credit/Debit Card and PayPal? Select Make a Payment from the Billing section of the menu. You can also choose to pre-pay for any active packages you have on your billing account by selecting the package under the "Pre-Pay Packages" section of the page. When selecting your package, you can choose the term in which you wish to pay all the way from 1 month up to 3 years. Note: If the package you wish to pre-pay has a currently due invoice, this invoice will automatically be selected and added to your subtotal. You can review your Payment Total at the bottom of this page. It will include the number of selections you have made, along with any pre-payments you have chosen. You will then be able to see a detailed list of all items included on your check out including tax, if applicable. After confirming that everything is satisfactory, you can select your Payment Method. If you wish to use a new credit card, you can do so by entering in the new credit card details. If you would like to save this card and enable it as the default card on your account, select the box next to the Save Card option, as shown below. If you wish to use the already saved credit card on file, select the tab Use Credit Card on File and click Make Payment button after selecting the saved card you wish to use. If you wish to use PayPal, select the tab Use PayPal and select Make Payment. You will be asked for your PayPal information on the next screen. Please also include your domain name on the check memo to help us locate your account. Note: HostGator cannot credit or apply a payment to your account until the payment is received, deposited and cleared. Payments by check or money order sent via postal mail may therefore require more time to process. You are welcome to switch how you pay at any time. There is usually no need to contact HostGator. Please follow the instructions for a one-time payment using the new method. If you pay an invoice before we charge your credit card, then we will not charge your card automatically. If you experience issues with payments, please contact HostGator support via phone or live chat support and we will be happy to assist you.